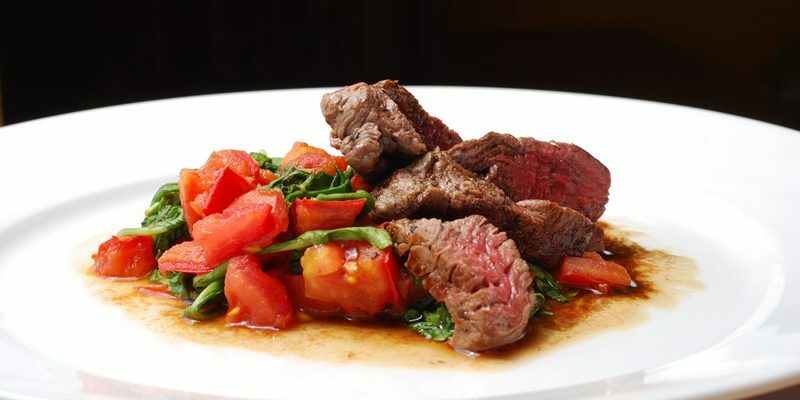 A real show stopper this beef tenderloin recipe has wonderful flavors of Tuscany; tomato, arugula, garlic and onions. Tuscan beef is famous for being very tender as the cows are nursed by their mothers and then fed preservative free grass. Here in the U.S. we use filet or often named beef tenderloin for the recipe but feel free to use the famous Chianina beef if you can find it ( in NYC, there is sure to be a butcher that can get it). This is a terrific dish to impress your guests as it looks like a lot more work than it is. As always my recipes are straightforward and can be done ahead up to finishing the beef in the oven. 1. Cut the beef into 4 even slices. 2. Heat 1 Tb. of the oil in a large skillet. Sauté the onions over medium heat 5 minutes, season with salt and pepper. Lower heat and cook 30 minutes, until caramel colored, stirring occasionally. Stir in tomatoes and arugula, set aside. 3. Heat a medium skillet and add the remaining tablespoon olive oil over medium- high heat. Sear the meat for 3 to 4 minutes per side seasoning with salt and pepper as you go. Transfer to a baking sheet. 4. Place the beef in the oven for 5 to 10 minutes depending on desired doneness. 5. Melt the butter in the same skillet and sauté the shallots until translucent about 2 minutes. Season with salt and pepper. Add the brandy and reduce to a few tablespoons over high heat. Add the stock and bring to a boil. Reduce by half and then taste for seasoning. Remove from heat. 6. Mound a serving plate with the onion-arugula mixture. Place the meat on top. Ladle sauce over meat and garnish with chopped parsley.